when I write the select statement for a table that has space in the name, sql assistant does not work. is it a set up function? You can always press Ctrl+Space to force the popup. But unless the code is correct and the table name is properly qualified, you won't get any useful results. this is the real sentence what I try to write. You get that after hitting enter to select one of the items in the popup? I then created a second table named 206 European Resorts$tests so that now I have 2 similar names. And it still works as expected. The only difference now is in the last case scenario, it doesn't complete the name automatically after 206, I get a popup with two matching names and I can select the one I want. You are likely doing something else. Please describe your steps in more details. The same here. The only way I was able to achieve the code seen on the second image is to type it exactly that way. I'd suggest recording a short video about the happenings there. With the old assistant version I only have to write the "Select * from " and select the table name but I have to write dbo. (shchema name) . So if If I continue writing give me more choice ( I have plenty of the tables all star with the same name). From now with the new version I have to select the table name one by one, I mean to say drill down to select the specific table one by one instead of to write the table name. it does not recognize "the space" between the words. What really I looking for is to write the "select * from " and popup the start of the all tables name and if i continue writing the tables names popup again the diff names. To write the select statement. following writing "space", European , "space", "Resort", "symbol ($)" , the "G" word, (here it should popup all tables start whith the "G" word. Okay, I understand now. Am I correct when I assume the following is happening? You try to filter the list of the names by typing the name from the start and as soon as you hit space the popup is gone, so you cannot fetch the desired table. b) the filtering (name matching) method I use (Name Contains Characters from Key String, Order by Best Match) is pretty much ignorant of this kind of issue, I never type space in filtering, even if it is present in the name. With all that said, I still think this limitation in the filtering is somewhat bug-ish. Simply pressing space should not dismiss the popup if it can be considered to be part of a name. Not even '.' does that. Correct. 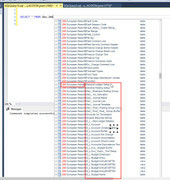 this is what happen with the new version of the sql assistant. version 5.2.59 allow space but whit this latest version of the assistant i can write with space. Temporarily, I'd suggest using Name Contains Characters from Key String, Order by Best Match as Name Matching Method and not using space for filtering until this kink is ironed out (if). And even after that, I'd suggest keeping using this one, as it is vastly superior to the other one that filters at the start of the name. For example, you could narrow the list down for easy selecting of the table "206 European Resort$General Ledger Setup" by only typing "206GLS" (possibly omitting 206 as well) which would leave you with a very few candidates (or a single one, if you're lucky) in the popup. That stuff is simply powerful when it comes to speeding things up in a large set of tables. Thanks all. We know now how to reproduce it. I'm going to submit a defect for this issue to have it fixed in some future maintenance release. Also thanks for the suggestion. I think this is a very good one. Not only it would enable skipping the prefix with a space, in this case of many tables with similar names it would be also much more efficient, you won't need to type the same prefix again and again. You can type just the key part of the table name and locate it in the list much faster. Here is how to change the "match" option. I have tried it like your recommendation but it's does not work. I'll waiting for the next release. Hope asap.